Enterprise Architect is a sophisticated and flexible modeling platform and the tool offers a rich set of features for both the development and the management of requirements for any size project in any domain and using a variety of processes. Requirements can be created in a variety of ways and then visualized in a series of windows and dialogs that make it easy to develop and manage them and to communicate within the team and to the business customers. Shows Requirements (and other element types) in a simple text format, and helps the modeler to create, edit and manage these elements. 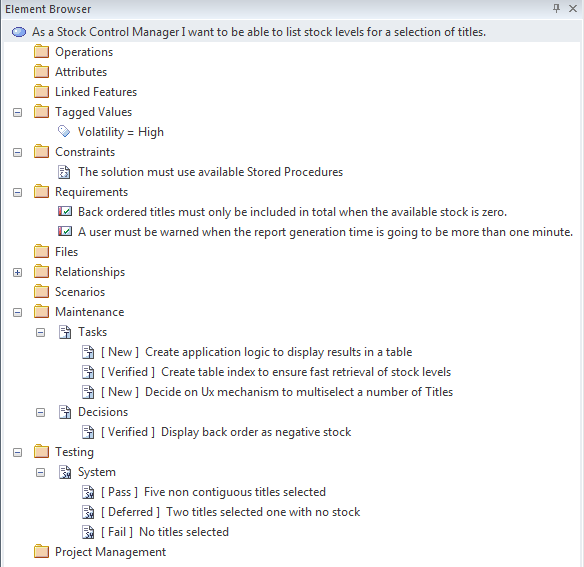 The Specification Manager will be the preferred tool for many requirement analysts as it allows the modeler to work in a familiar spread sheet-like interface and edit requirement properties such as Status, Priority and Difficulty using drop-down lists and to add notes to the Requirements without needing to draw diagrams. Shows the content and structure of the repository and allows requirements to be viewed in a hierarchy of Packages, elements and diagrams. 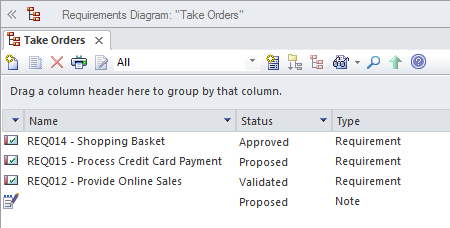 Shows the arrangement of a group of Requirements and other elements, and can show whether the elements are in the same Package or different Packages. 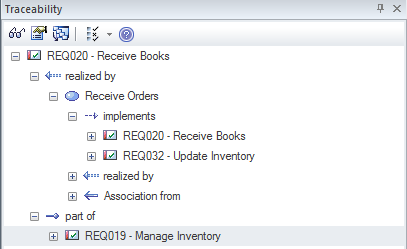 It is a powerful way of presenting requirements information because connectors can be created to show how the a Requirement relates to other elements in the Repository including other Requirements. Shows one group of elements on the horizontal axis and another group of elements on the vertical axis with markers indicating if they have a relationship and an arrow showing the direction of the connector. Relationships can be created directly in the matrix and these will be displayed on diagrams containing the source and target elements. The Relationship Matrix is a powerful tool to quickly visualize gaps or missing requirements and is particularly useful for project managers and business stakeholders who might be less familiar with diagrammatic representations of Requirements and formal languages such as the UML. 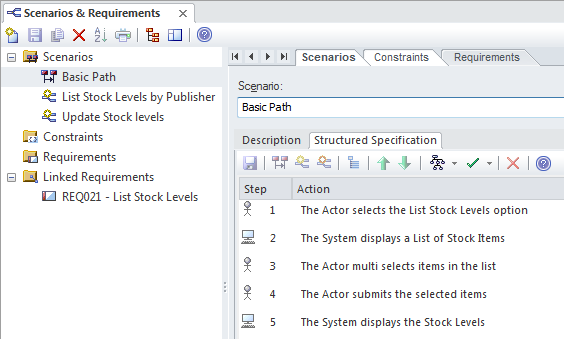 Used to create Scenarios, Constraints such as pre-conditions and post-conditions and to detail the steps of Use Case Scenarios. It can also be used to create behavior diagrams that allow the steps in a Scenario to be visualized and used as a target or source for connectors. Used to display the hierarchy of elements based on their relationship to other elements. 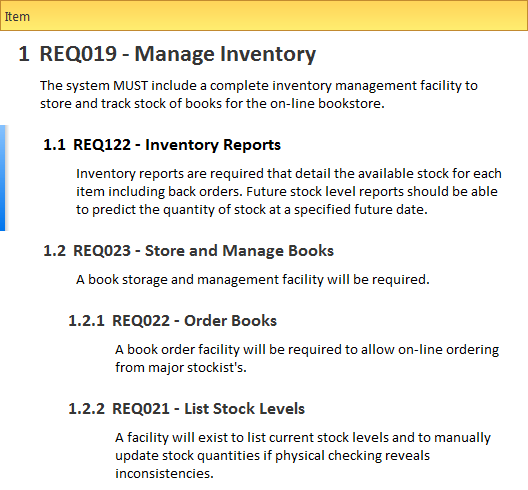 While the Project Browser will give a structural view based on containment in a name space the Traceability window displays related elements regardless of their location in the repository. Lists the elements in a diagram, filtered and sorted according to the settings you define; shows all or selected default properties of each element. 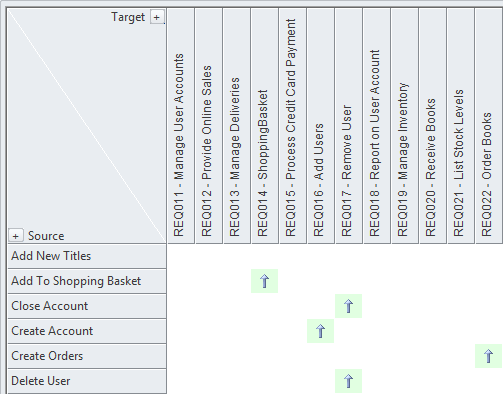 The properties can be edited in-line for each Requirement and new Requirements can be created in the diagram list. Lists the elements in a Package, filtered and sorted according to the settings you define; shows all or selected default properties of each element. Displays a selected element's Attributes, Tagged Values, Constraints Internal Requirements, Relationships, Maintenance Items, Testing, Project Management items, Files, and more. It is a powerful way of displaying this information in one place without the need to open up other windows. Enables you to locate Requirements in general in the model, or specific Requirement elements, according to the search criteria you use. 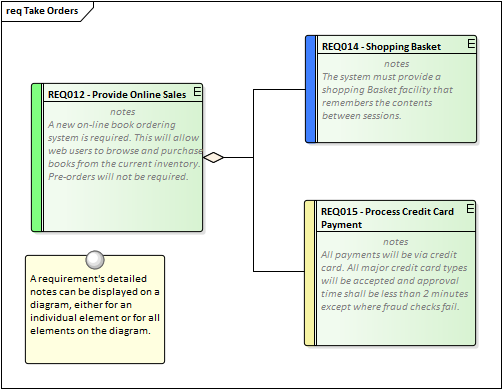 Enables you to maintain links to commonly-used elements, and to rapidly show developments and changes in (Requirement) Package contents through either reports or slide shows of selected diagrams.